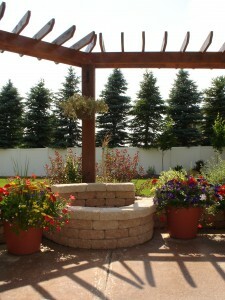 Have you been contemplating adding your dream patio or pergola to your yard? Patios and pergolas go together like grilling and the Fourth of July. They’re perfect areas to not only accent your beautiful Utah landscape, but also to provide useful areas for grilling, an outdoor kitchen area, or a cozy fire pit. Pebble Creek Landscaping can help you design and build your dream landscape complete with concrete or stamped concrete patio and pergola. We can even help you add the perfect lighting to accent your new landscape’s look. With our commitment to service and attention to detail, your satisfaction is guaranteed. Contact one of our specialists now – and make your Park City or Draper dream landscape a reality.